Draft: 2000, Florida Marlins, 1st rd. Adrián Sabin González graduated from Eastlake High School in Chula Vista, CA in 2000...His father, David, played amateur baseball in Mexico and was a first baseman on the Mexican National Team...His older brother, Edgar, made his major league debut with the Padres on May 12, 2008...On May 13, 2008 at Chicago-NL, the duo started in the same infield with Adrián playing first base and Edgar playing third base...Played for Team Mexico in the World Baseball Classic in 2006, 2009, 2013 and 2017...Was honored by Mexico with its national sports award, the 2014 Premio Nacional del Deporte...Helped renovate a Little League baseball field in Tijuana in 2012, which was renamed in his honor...González continues to financially support two baseball fields in Tijuana for youth, Campo Adrián González en la Liga Municipal de Tijuana...In December 2014 he made a significant commitment in support of youth baseball in Mexico, creating Liga de Béisbol Telmex Adrián González. Right elbow soreness and lower back discomfort limited him to 71 games...His last game of the season came September 26 vs. San Diego where he hit a home run in his final at-bat...Went on the 10-Day Disabled List for the first time in his career on May 5 with right elbow soreness... Was activated on May 18...Was placed on the 10-Day DL on June 12 with lower back discomfort... Transferred to the 60-Day DL on July 29...Was activated from the 60-Day DL on August 18. Hit .285 with 31 doubles, 18 homers and 90 RBI in 156 games...reached 90 RBI for the 10th consecutive season since 2007, becoming the only Major League player to accomplish the feat...Batted .297 with runners in scoring position (43-for-145) and went 6-for-13 (.462) with the bases loaded, including a grand slam on July 24 at STL... Collected his 400th career double on July 8 against the Padres (finished season with 415 2B) and hit career home run No. 300 on Aug. 7 off Boston's Junichi Tazawa (finished season with 308 HR)…is one of five active players with 400 doubles and 300 homers along with Adrian Beltre, Carlos Beltran, Albert Pujols and Miguel Cabrera ...Batted .412 (28-for-68) during his 17-game hitting streak from Aug. 6-24, which tied for the second longest streak of his career...Had a career day on Aug. 22 at Cincinnati, going 3-for-6 with a career high-tying three home runs (also: April 8, 2015 vs. SD) and a career-high eight RBI…the eight RBI tied for the second most in a single game in Los Angeles history with Ron Cey (7/31/74 at SD) and Yasmani Grandal (5/7/15 at MIL), behind only James Loney's nine on Sept. 28, 2006 at COL...Hit two homers for the Dodgers in the NLDS and NLCS, combining to go 8-for-41 (.195) with six RBI in 11 playoff games. Led the Dodgers in hits (171), homers (22), RBI (100) and games played (157) in his first full season with the club... Batted .323 with runners in scoring position (51-for-158), the 13th best mark in the NL, and hit .356 with RISP and two outs (21-for-59, 10th, NL)... Tied for the fifth-most RBI in the NL with 100 and joined Miguel Cabrera (7) and Prince Fielder (6) as the only players to reach the century mark six or more times in the last seven years...has reached 100 or more RBI in four consecutive seasons... Posted a season-high RBI streak for a Dodger with an RBI in seven consecutive games from Aug. 6-12 (9 RBI)…was the second-longest streak of his career behind a nine-game run from June 3-12, 2011 (14 RBI) and was the longest single-season streak for a Dodger since Adrian Beltre's eight-game streak from Aug. 17-24, 2004 Reached the 20-home run mark for the seventh time in the last eight years... Posted 46 multi-hit games and his 13 three-hit games tied for the seventh most in the National League... Hit .303 (88-for-290) in 79 games at Dodger Stadium, which was the 14th-best home mark in the NL... Knocked a pair of walk-off hits (eight career walk-off RBI); hit his first walk-off of the year, a double, in a 12-inning, 5-4 win over the Mets on Aug. 14 and picked up his second walk-off hit of the season on Sept. 12 with a one-out single to give Los Angeles a 3-2 win over the Giants in 10 innings... Selected as a finalist for a Rawlings Gold Glove Award... Hit safely in eight of the Dodgers' 10 postseason games, batting .315 (12-for-38) with seven runs scored, two doubles, three homers and seven RBI…in Game 5 of the NLCS vs. St. Louis, went 3-for-4 with three runs scored and a pair of solo home runs in the Dodgers' 6-4 win at Dodger Stadium…it was the 10th multi-homer postseason game in franchise history... Selected as the Dodgers' 2013 nominee for the Roberto Clemente Award, which recognizes a Major League Baseball player who best represents the game of baseball through positive contributions on and off the field, including sportsmanship and community involvement. Batted .299 with a career-high 47 doubles, a triple, 18 home runs and 108 RBI in 159 combined games with the Dodgers and Red Sox...acquired by Los Angeles in a nine-player trade on Aug. 25. Reached the 100-RBI mark for the third consecutive season...has collected at least 100 RBI four times in the last five seasons since 2007, one of seven Major Leaguers to do so, joining Ryan Braun, Miguel Cabrera, Prince Fielder, Ryan Howard, Albert Pujols and Mark Teixeira Following his acquisition from Boston, led Los Angeles with a .297 batting average, 43 hits, 10 doubles and 22 RBI through the conclusion of the season. Ranked second in the big leagues with a .392 combined batting average with runners in scoring position (67-for-171), including a .368 mark with Los Angeles (14-for-38). Completed the campaign ranked among the Major League leaders in hits (188, 10th), multi-hit games (57, 6th), doubles (47, 5th) and RBI (108, T-7th)...his 63 RBI after the All-Star break were the third most in the big leagues. Finished the season on a 15-game hitting streak, batting .390 (23-for-59) with three doubles, two homers and six RBI during the run from Sept. 19-Oct. 3...was the longest hit streak by a Dodger this season...had three hitting streaks of 10 or more games this season, including an 18-game streak from June 20-July 7 with Boston (.377, 29-for-77). Hit .322 against left-handed pitchers (74-for-230), the highest batting average against lefties by a lefthanded hitter in the Majors. Ranked second among Major League first basemen with a .998 fielding percentage at the position, committing just three errors in 1,246.0 innings in 151 games (139 starts). Led the Red Sox with 11 game-winning RBI (11th in AL) and 22 go-ahead RBI (T-6th in AL) at the time of the trade...also led the club with 43 multi-hit games (29 2H, 14 3H) and 21 multi-RBI games. Posted a .372 batting average (35-for-94), the fourth-best mark in the AL, and knocked in 19 RBI in 24 July games for Boston. Twice named American League Player of the Week, taking home the honor for the periods of July 16-22 and Aug. 6-12 (co-player of the week with Baltimore's Manny Machado). In his 1st season with the Red Sox, tied for the Major League lead with a career-high213 hits and led the Majors with 66 multi-hit games...Named to 4th straight All-Star team...Tied for the 4th-most hits in team history, the most ever by aRed Sox 1st baseman as well as the most by a player in his debutcampaign with the club...His 66 multi-hit games were the most by a Red Sox since NomarGarciaparra in 1997 (68)...Tied for the ML lead with 25 games with3+ hits, the most by a Red Sox since Wade Boggs in 1988 (28)...Also ranked among AL leaders in AVG (2nd, .338), RBI (3rd,117), total bases (2nd, 345), doubles (T-6th, 45), extra-base hits(5th, 75), runs (5th, 108), games (T-4th, 159), at-bats, (8th, 630),SLG (7th, .548), OBP (3rd, .410), OPS (3rd, .957), intentionalwalk (3rd, 20), home AVG (3rd, .347), road AVG (3rd, .327),night AVG (4th, .348), day AVG (7th, .316), AVG vs. RHP (2nd, .347) and RISP AVG (6th, .337)...Grounded into28 double plays, most in the AL...Set career highs in hits, runs, AVG, OBP and total bases...The only other Red Sox ever to post an AVG of .338 or better in at least as many at-bats or games played wasWade Boggs in 1985 (.368, 653 AB, 161 G)...His .338 clip was the best by a Red Sox qualifier in his 1st seasonwith the club since Jimmie Foxx in 1936 (.338)...Was the only Major Leaguer in 2011 to finish the year with at least 200 hits and 115 RBI and just the 3rd RedSox ever to reach the mark (5th time), joining Mo Vaughn (1996, 1998) and Jim Rice (1978-79)...Was the 1st AL 1st baseman to reach 213 hits, 117 RBI and 75 extra-base hits in a season since CLE's HalTrosky in 1936 (216 H, 162 RBI, 96 XBH)...In that time, the only other Major League 1st baseman to reach thosemarks was COL's Todd Helton in 2000 (216 H, 147 RBI, 103 XBH)...Became the 5th Red Sox player (15th time) ever with 25+ homers and a .338 AVG or better in the sameseason, joining Jimmie Foxx (1936, 1938-39), Ted Williams (1941-42, 1946-49, 1954, 1955, 1957), Nomar Garciaparra(1999) and Manny Ramirez (2002)...Finished 2nd in the AL with 30 go-ahead RBI and 3rd with 17 game-winning RBI...Named 1st baseman on Rawlings' AL Gold Glove Team, his 3rd career Gold Glove Award and 1st in the AL.....Became the 3rd Red Sox 1st baseman to win a Gold Glove, joining George Scott (1967-68, 1971) and KevinYoukilis (2007)...Was the 1st player to win a Gold Glove at any position in his 1st season with the Red Sox...Was elected an All-Star starter for 1st time, his 4th career All-Star nod and 1st in the AL...Went 1-for-2 inthe 7/12 exhibition at ARI, accounting for the AL's only run and only extra-base hit with a solo HR in the 4thinning off Cliff Lee...Placed 2nd with 31 total homers in the Home Run Derby, his 2nd career derby competition...Named the 1st baseman on The Sporting News' year-end AL All-Star team...Finished 2nd among AL 1st basemen with a career-best .997 fielding pct. (4 E/1,351 TC) and led AL 1st sackersin games (156), starts (155), innings (1,352.2) and assists (125)...His 4 errors were the 2nd fewest ever by aRed Sox 1st baseman who made at least 140 appearances at the position after McInnis' 1921 season (1 error)...Made 2 starts in right field during Interleague action (6/29 at PHI, 7/2 at HOU), his 2nd and 3rd career gamesat any position other than 1st base and designated hitter (also a start in RF on 9/30/05 with TEX vs. LAA)...Boston went 51-21 (.708) when he drove in at least 1 run and 26-7 (.788) when he drove in at least 2...TheRed Sox were 73-45 (.619) when he recorded a hit and 45-21 (.682) when he had at least 2 knocks...Selected as The Sporting News' 1st-half AL MVP...Led the Majors with 128 hits, 77 RBI, 214 total bases, 29doubles and 49 extra-base hits while pacing the AL in AVG (.354) and multi-hit games (40) prior to the break...His 128 hits were the most ever for a Red Sox before the All-Star break (since 1933)...Hit .349 with 73 RBIthrough Boston's 1st 81 games of the season, the 1st player to reach those marks through 81 games in his 1stseason with the Red Sox...Started each of Boston's 1st 85 games through 7/5, the most consecutive starts to begin a Red Sox seasonsince Mo Vaughn in 1996 (1st 99 games)...Did not play on 7/6, snapping a streak of 166 consecutive teamgames played dating back to 7/4/10...Was the 1st Major Leaguer to reach 50 RBI, doing so in his 59th game on 6/5...Over the previous 60 years,only Manny Ramirez (40 G) and Carl Everett (46) reached 50 RBI fewer games into their Red Sox careers...Led the Majors in RBI and AVG through 8/27, the latest date that a Sox player has led the Majors in bothcategories at the same time since 1949, when Ted Williams did it through 10/1...Ranked among Interleague leaders in hits (2nd, 33), total bases (3rd, 46), RBI (T-3rd, 17) and AVG (3rd, .423)...Paced Major League road leaders in total bases (183) and extra-base hits (tied, 44)...Topped the Majors (min. 30 PA) with a .486 AVG (34-for-70) in 18 games against Baltimore...Since 1946, theonly Red Sox batter with a better single-season mark against the O's was Marty Barrett in 1987 (.529)...Made his Red Sox debut on 4/1 at TEX andhit an RBI single in the 1st inning...Notchedhis 2nd career stolen base, his only of the season,in that game, 1st since 4/28/09 at COL.....Connected for 1st homer as a Red Sox on 4/6at CLE, a 2-run shot in the 7th...4/8 vs. NYY marked his 1st-ever contest atFenway Park in his 865th career Major Leaguegame...At the time, Aramis Ramirez (1,540)was the only active player with more career games without playing at Fenway Park...Scored his 500th career run on 4/29 vs. SEA...Tripled in the 4th inning on 6/19 vs. MIL for 1,000th career hit...In May, led the Majors with 42 hits and ranked 2nd with 31 RBI, the most by a Red Sox in May since 1999(Nomar Garciaparra, 33)...Was the only Major Leaguer with 40+ hits and 30+ RBI in any month of 2011 andthe 1st Red Sox to do it in May since Jim Rice in 1978 (45 H, 33 RBI)...Hit 9 May homers, with 8 in 11 games from 5/3-14, including in 4 straight tilts from 5/10-14 (5 total HR)...Hit a walk-off, 2-run double in the 9th inning for an 8-7 win on 5/16 vs. BAL...Was his 5th career walk-offhit...Drove in the go-ahead run with an RBI double in the 11th inning of Boston's 4-2 win at LAA on 4/21...Named AL Player of the Month for June, his 1st career monthly honor...Hit a Major League-best .404 (40-for-99) with 8 doubles, 2 triples, 6 homers and 25 RBI in 25 games during the month and ranked among AL Juneleaders in RBI (T-1st), hits (2nd), runs (2nd), OBP (2nd, .478) and SLG (2nd, .707)...Notched a career-high 9-game RBI streak from 6/3-12 (14 total RBI), tied for longest in the AL in 2011 andthe longest by a Red Sox since Manny Ramirez's 10-gamer from 9/14-24/02...Boston won each of the 9 gamesduring that stretch, making Gonzalez just the 4th Major Leaguer since 1935 to drive in a run in 9 or more consecutivegames with their team winning each, joining Al Rosen (9 games, 1954 Indians), Sixto Lezcano (9, 1982Padres) and Dwight Evans (10, 1989 Red Sox)...Posted a season-high 14-game hit streak from 7/20-8/4, batting .483 (28-for-58) in the stretch...Hit .415(27-for-65) with 6 homers, 17 runs and 17 RBI during a season-high 17-game on-base streak from 5/29-6/17...Had multiple hits in a career-high 7 straight games from 7/24-31, tied for the longest such streak in theMajors in 2011...Was the longest multi-hit streak by a Red Sox since Kevin Youkilis' 9-gamer from 5/20-29/07...Tabbed AL Player of the Week for 8/22-28, his 5th career weekly honor...In 7 games, hit .393 (11-for-28) witha double and 8 runs while leading the Majors with 5 homers (tied), 9 RBI (tied) and 27 total bases...Hit 5 homers in a 3-game span from 8/23-25 at TEX, the 1st Red Sox with 5 home runs over 3 tilts since KevinMillar, 7/21-23/04...Went deep twice on 8/23 and 8/25, his 12th and 13th career multi-homer tilts...Also wentdeep twice on 5/10 at TOR...Participated in Boston's 5-4-3 triple play on 8/16 vs. TB (G2) with Jed Lowrie and Dustin Pedroia, the 1st tripleplay turned by Boston since SS John Valentin did it unassisted on 7/8/94 vs. SEA...On 9/3 vs. TEX became the 1st Red Sox 1st baseman in the Divisional Era (since 1969) to turn a pair of unassisteddouble plays in a game. Named to 3rd consecutive All-Star team in last season in San Diego and won 4th teamMVP Award...Paced Majors with a .407 average (48-for-118) with runners in scoring position.Earned 3rd straight Padres Most Valuable Player Award from the San Diego Chapter of the BBWAA, 4th timeoverall receiving the honor (also 2006)...Finished 4th in NL MVP voting (1 2nd-place vote, 3 3rd).Recorded 4th consecutive 30-home run season (31) and 3rd career 100-RBI campaign (101)...His 4, 30-homerun seasons extended his franchise record (2 more than Phil Nevin, Fred McGriff and Nate Colbert) while 3,100-RBI seasons tied Phil Nevin for the most in club history.Jumped from 5th (130 HR) to 2nd (161) on the Padres all-time home run list, passing Ryan Klesko (133), TonyGwynn (135), Dave Winfield (154) and Phil Nevin (156).Ranked among NL leaders in games played (T-5th, 160), hits (7th, 176), home runs (T-8th, 31), RBI (12th,101), total bases (T-6th, 302), walks (3rd, 93), intentional walks (2nd, 35), on-base percentage (5th, .393), slugging(9th, .511) and OPS (7th, .904).Placed 5th in the NL with a .315 clip (97-for-308) on the road and 6th in the circuit with a .337 mark (67-for-199) against left-handed pitching.Tied for 2nd in the NL with a .545 average (6-for-11) with the bases loaded, including 3 grand slams: 4/23 atCIN off Micah Owings, 6/2 vs. NYM off Raul Valdes (a walk-off), and 8/26 vs. ARI off Sam Demel...The 3 slamstied for the most in the Majors with Kansas City's Yuniesky Betancourt and New York's (AL) Alex Rodriguez...Hiswalk-off slam on 6/2 against the Mets gave San Diego a 5-1 win in 11 innings and was the 5th game-endinggrand slam in Padres history.Led the Padres in most offensive categories, including runs (87), hits, doubles (33), home runs, RBI, walks,batting average (.298), on-base percentage (.393), slugging (.511), extra-base hits (64) and total bases.Finished 2nd among NL first basemen with 1,459 total chances and 1,324 putouts, 3rd with 127 assists, 125double plays and 159 games, and 5th with a .995 fielding percentage (8 errors).Selected to the All-Star team via the Player Ballot and went 0-for-2 as a defensive replacement at first basein the National League's 3-1 victory at Angel Stadium on 7/13.Homered in 2 consecutive games on 4 occasions and in a season-high-4 straight contests from 4/21-25...Recorded2 multi-homer games, tying career high with 2 home runs 6/7 at PHI and 9/15 at COL (10th career multi-HR tilt).Set a career high with 6 RBI 5/19 at LAD...Also had 5 RBI on 9/15 at COL.Tallied, 2 season-high, 11-game hitting streaks, 6/11-23 (.450, 18-for-40) and 8/28-9/8 (.459, 17-for-37).Hit .322 (64-for-199) over his final 55 games (8/6-10/3), posting a .416 OBP and .538 SLG (.954 OPS). 2009: Played in 160 games, including 153 starts at first base...named the team's Most Valuable Playerfor the third year (2006, 08) as voted on by the San Diego Chapter of the BBWAA...also honored withhis second consecutive All-Star Game selection and Rawlings Gold Glove Award.Set career highs in home runs (40), walks (119), on-base percentage (.407) and slugging percentage ... (.551) whilestriking out just 109 times, his lowest total since joining the Padres...more walks than strikeouts for the first time inhis career...22 intentional walks.... Ranked fifth in the Majors with 40 home runs and first with a franchise-record 28 on the road.... First Padre to record three 30-home run seasons and the only Padre with 35 or more homers in consecutive years...one offour Padres all-time to hit 40 or more home runs...has increased his HR total in each of his six Major League seasons.... Led MLB with 119 walks and ranked second with 22 intentional walks...recorded the 10th 100-walk season in franchisehistory, joining five other Padres (Clark, Giles, Henderson, McGriff, Tenace).... Set a franchise record with nine home runs in April.... Belted 458-foot home run 4/26 vs. PIT (off Ohlendorf) estimated as the longest in PETCO Park history (through 2009 season).... Homered in five straight games 5/10-15...six home runs over five-game stretch...second Padre to homer in five straight(Nettles, 6 in 1984)...also homered in four straight 5/30-6/2.... Received NL Player of the Week honors twice, sharing with Philadelphia's Ryan Howard for the week of 5/25-31 andwinning again for the week of 8/10-16.... First Major Leaguer since 1920 to walk two or more times in eight consecutive games (6/1-9)...first Padre since RickeyHenderson (1996) to walk in 10 consecutive games (5/31-6/10).... Represented the Padres in the All-Star game for the second time, walking in his only plate appearance...also participatedin the Home Run Derby for the first time.... Hit .311 (76-for-244) with 17 doubles, one triple, 16 home runs, 47 RBI and 41 runs scored in 72 games after the All-Star break.... Did not play 8/4 vs. ATL, snapping a streak of 314 consecutive games played...longest streak in franchise history andthe longest active streak in the Majors at the time.... Became the first Padre to go 6-for-6 in a game and the fourth Padre to record six hits in a game 8/11 at MIL...first Padreto record six hits in a nine-inning game. Named to his ﬁrst career All-Star team, selected as a result of player balloting...ﬁrst San Diego position player selected since Mark Loretta in 2004...earned his ﬁrst Gold Glove Award, becoming the ﬁrst Padres ﬁrst baseman and ninth Padre overall to win the award, bringing the total number won by San Diego players to 20...received the Padres MVP Award from the San Diego Chapter of the BBWAA...Set career highs in games played (162), home runs (36), RBI (119), runs scored (103), walks (74) and slugging percentage (.510)...Tied for second among all Major Leaguers with 162 games and third with 1417.1 innings played in the ﬁeld...22 road homers tied for ﬁrst in the Majors and 70 road RBI placed second...His 119 RBI ﬁnished third in the National League...the ﬁrst Friar to ﬁnish in the top ﬁve in the league since Ken Caminiti ﬁnished third with 130 RBI in 1996 (Elias)...Also ranked among NL leaders in home runs (7th), total bases (T-9th, 314), road batting average (8th, .308), batting with runners in scoring position (4th, .325), average vs. right-handed pitching (7th, .320), intentional walks (T-4th, 18), at bats (8th, 616) and RBI ratio (8th, 5.2 at-bats per RBI)...Appeared in 161 games at ﬁrst base (159 starts), committing six errors in 1,442 total chances with a career-high .996 ﬁelding percentage...led NL ﬁrst basemen in games and innings played, while also ranking among league leaders at the position in putouts (4th, 1,306), assists (4th, 130), double plays (2nd, 129) and ﬁelding percentage (2nd)...Batted .308 (100-for-325) on the road...hit in 63 of 81 road games, including 19 consecutive road tilts from 4/11- 5/13...Hit .320 (122-for-381) with 27 doubles, 24 homers and 81 RBI off right-handers compared to .213 (50-for-235) off left-handers...His ﬁve homers in Interleague Play tied for fourth in the NL and tied for sixth in the Majors...Season-high, nine-game hit streak 4/29-5/8 (.375, 15-for-40)...On 5/12, Adrian's older brother Edgar made his ML debut with SD...became the sixth set of brothers to play for the Padres and fourth pair to play together...Adrian (ﬁrst base) and Edgar (third base) became the ﬁrst set of brothers to appear on the inﬁeld in the same game for SD on 5/13 against the Cubs at Wrigley Field...the last time two brothers on the same team had started a game at inﬁeld positions was 9/27/98 when two pairs of brothers started at the four inﬁeld spots for the Reds in a home game vs. PIT: the Larkin brothers at shortstop (Barry) and first base (Stephen) and Boone brothers at second base (Bret) and third base Aaron) (Elias)...Knocked 10 homers and collected 29 RBI in May, both career highs for a month and tied for third most in the month among all Major Leaguers...RBI total marked highest by a Padre in May since Ryan Klesko had a club-record 40 in 2001...His 21 homers through the Padres ﬁrst 81 games were second most in club history to Greg Vaughn's 26 in 1998 through the halfway point...66 RBI tied Vaughn (1998) for third most through 81 contests, two shy of Klesko's club record in 2001 (Elias)... knocked 22 long balls before the All-Star break, tied for second most in franchise history (Colbert, 1972; Winﬁeld, 1979) behind Vaughn's club-record 30 homers in 1998...71 RBI before the All-Star Game tied for ﬁfth in franchise history with Klesko's 75 RBI (84 games) before the All-Star game in 2001 being the club mark...Played in his ﬁrst All-Star Game on 7/15 at Yankee Stadium...entered the game in the sixth inning at ﬁrst base and went 1-for-3 with a sacriﬁce ﬂy and one RBI in the 4-3, 15-inning loss to the American League...Tied his career high with two homers 7/26 at PIT and 9/11 vs. SF...on 9/11, brother Edgar also knocked a pinch-hit homer...they became the ﬁrst set of brothers in Padres history to accomplish the feat and ﬁrst pair of brothers overall to tally homers in the same game since Bengie and Jose Molina on 7/31/05 for the Angels at NY (AL)...Hit safely in 14 of the last 16 tilts of the season, going 21-for-63 (.333) with 20 RBI...On 9/27 vs. PIT, the Gonzalez brothers and LaRoche brothers (Adam and Andy) started for opposing teams in the same game...according to Elias, the last time this occurred was 8/12/03 when the Alomar brothers' White Sox played against Jose and Bengie Molina of the Angels. SUMMARY: Hit .282 (182-for-646) in his second season with the Padres...ranked tops among Major League first basemen with 161 games and a career-high 46 doubles, and second with 79 extra-base hits...ranked among National League leaders in doubles (5th) and extra-base hits (7th)...tallied a team-high 48 multi-hit games, ranking fourth in the NL...set career highs in at-bats, runs, doubles, triples, homers, RBI, total bases and walks...belted his first career grand slam in the 163rd game of the season, 10/1 at COL, giving him 30 homers and 100 RBI...hit safely in 15 of his final 18 games, going 26-for-74...also hit safely in 18 of 19 games from 8/19-9/8 (.358, 29-for-81), including a season-high 11-game hit streak, 8/28-9/8...posted a .321 average (36-for-112) in August with seven home runs and 14 RBI...hit safely in 21-of-28 games during the month...tallied an eight-game hit streak, 7/22-29 (13-for-34, .382), with five multi-hit contests...went 4-for-5 with three doubles and a home run, 6/17 at CHC...one of three, four-hit games on the season (also 4/17 at CHC and 8/24 at PHI)...hit .421 (16-for-38) over a 10-game hit streak (5/24-6/3)...knocked a first-inning, three-run home run 4/20 at COL...finished 2-for-6 with a career-high-tying four RBI (fifth time). APRIL ONSLAUGHT: His 25 RBI in April established a new franchise record for RBI in the month...also knocked seven homers, tying the club record for homers in the month of April (Ken Caminiti, 1998; Ryan Klesko and Rondell White, 2003)...batted .309 in the month (34-for-110). GONE-ZO: Finished with 30 home runs on the year, a career high and his second consecutive season with more than 20 long balls...one of 12 Padres all-time with multiple 20+ homer seasons and the 12th 30+ homer season in franchise history...it was the first 30 homer season by a Padres player since Phil Nevin (41) and Ryan Klesko (30) in 2001...with 100 RBI, Gonzalez is the first Padre to reach the 100 RBI plateau since Nevin drove in 105 in 2004. DOUBLE TROUBLE: His 46 doubles rank third on the Padres all-time single-season list...additionally, his 32 doubles on the road is a club record and was tops in the Majors in 2007. EXTRA, EXTRA: Finished with 79 extra-base hits, ranking tied for third on the Padres all-time single-season list...marked the most by a Padres player since Greg Vaughn's 82 in 1998...also tallied 53 extra-base hits on the road, a franchise single-season record. MR. .300: Finished with a .304 average (173-for-570) with38 doubles, 24 home runs, 82 RBI and 83 runs scored in156 games, playing more than 50 games in a season forthe first time in his career...led the Padres in numerousoffensive categories including batting average (.304), hits(173), home runs (24), doubles (38) and slugging percentage(.500), while trailing only Brian Giles in games played (156)and at-bats (570)...was named team MVP in 2006...drovein a career-high four runs three times (July 14 vs. ATL, July17 vs. PHI, September 16 at LAD) and tallied a career-highfour hits on four occasions (April 12 at FLA, June 28 vs. OAK,Sept. 12 at CIN, October 1 at ARI)...knocked his 20thhomer of the season August 10 at New York (NL), becomingthe first Padres player to hit 20 homers in a season sincePhil Nevin (26) and Brian Giles (23) in 2004...hit two homersJuly 17 vs. Philadelphia for his second multi-homer game ofhis career (also two HR, July 14 vs. ATL)...is the only playerto collect two multi-homer games in the history of PETCOPark...slotted everywhere in the lineup from third througheighth, but made 78 starts in the five-hole. SWEET 17: Hit in a career-high 17 straight games May17-June 9, batting .356 (21-for-59) with three doubles, fourhomers, five RBI and nine runs scored during the streak...the17-game hit streak was the longest for a Padres player thisseason and longest since Eric Owens hit in 18 straight contestsJune 17-July 6, 1999...recorded a second 17-game hitstreak July 6-26, batting .432 (32-for-74) with seven doubles,eight homers, 21 RBI and 18 runs during the streak...he isthe first Padres player since Tony Gwynn (1997) to recordtwo hit streaks of 15 games or more in one season. HALFTIME: Hit .336 (90-for-268) with 22 doubles, 11 home runs and 45 RBI in 72 games after the All-Starbreak...reached base safely in 36 of his final 41 games with 46 hits (11 doubles, four homers) and 21 walks...hitsafely in 17 of his last 22 contests, batting .413 (33-for-80) with seven doubles, three homers and 17 RBI overthe 22-game span (since Sept. 9), marking the best average in the National League during that span. BEST WEEk EVER: Named the National League Player of the Week for July 17-23, leading the league inbatting average (.607), slugging percentage (.964), on-base percentage (.645), hits (17) and total bases (27)and tying for the NL lead in runs scored (nine)...closed out the month of July with a .362 average (38-for-105)with eight homers, 25 RBI, nine doubles and a .676 slugging percentage in 26 games. SEVEN AND SEVEN: Belted seven homers in seven games July 7-17...the seven home runs over a periodof seven games are the second-most in Padres history, falling one short of Nate Colbert's eight home runsin seven games July 30-Aug. 3, 1972 (including five in a doubleheader). WHO'S No. 1: On Opening Day (April 3 vs. San Francisco) became the seventh No. 1 overall player to appearin a Padres uniform...in that game, went 2-for-4 with a double and two runs scored in his Padres debut. POSTSEASON PLAY: In the Division Series vs. the St. Louis Cardinals, batted .357 (5-for-14) with threewalks...scored two of the six Padres runs in the series. Batted .227 with seven doubles, six home runs and 17 RBI in 43 games (39 starts) overthree stints with Texas...spent the rest of the season at Triple-A Oklahoma...batted .303 (145-for-478) with24 home runs and 82 RBI between Texas and Oklahoma...Was only rookie position player on the Rangers' season-opening roster...earned spot on OpeningDay roster by batting .392 (31-for-79) with seven doubles, two home runs and 22 RBI in 29 games duringSpring Training for Texas...tied for Major League lead with 31 hits and tied for fifth in Cactus League with 22RBI...started 31 regular season games as designated hitter, seven at first base and one in right field...batted.194 (7-for-36) with two home runs and four RBI in first stint with Texas, April 5-19...homered in back-to-backgames on April 12-13 vs. Los Angeles of Anaheim...optioned to Oklahoma on April 20 and recalled on July 23,batting .333 (4-for-12) with one homer and two RBI in four games in second stint with the club...was optionedon July 31 and subsequently recalled on Aug. 18, staying in the Major Leagues for the remainder of theseason...hit safely in career-high eight straight games from Aug. 31-Sept. 10, batting .345 (10-for-29)during that stretch to raise season average from .216 to .252...five of 12 and 14 of his last 32 hits went forextra bases...batted .071 (1-for-14) against left-handers and .243 (33-for-136) against right-handers...hit .182(14-for-77) at Ameriquest Field in Arlington and .274 (20-for-73) on the road...made first career appearancein the outfield with a start in right field Sept. 30 vs. the Los Angeles Angels of Anaheim...Batted .338 (111-for-328) with 18 home runs and 65 RBI in 84 games for the RedHawks...recordeda .561 slugging percentage and .399 on-base percentage...hit .402 (51-for-127) with nine homeruns and 35 RBI in his last 30 games with Oklahoma, recording a .488 mark (21-for-43) with five homers and19 RBI in 11 games in his final stint with the club, from Aug. 5-17...recorded three multi-homer games,including a three-homer contest on April 24 at Albuquerque...homered in consecutive games on four occasions...posted season-high nine-game hitting streak from July 22-Aug. 13...had four games with four-plusRBI, including fi ve-RBI contests on April 24 and Aug. 12...batted .362 (54-for-149) in 41 games at homeand .318 (57-for-179) in 43 road contests...averaged .370 (37-for-100) with runners in scoring position and.390 (16-for-41) with RISP and two outs. Former first overall draft selection made his major league debut, batting .238 with a homer and seven RBI over two stints and 16 games withTexas...started 10 games at first base for the Rangers...named organization's eighth-best prospect by Baseball America following the season. Texas: Recalled from Oklahoma on April 16 to take spot of injured Mark Teixeira...made ML debut on April 18 at Seattle, going 0-3in start at first base...recorded first major league hit in next game on April 20 at Anaheim, a single to center off Ramon Ortiz...hit safelyin career-high 4 straight games from April 20-23...on April 25 vs. Seattle, posted career best 3 hits...had 2 doubles and first careerhomer that day off Mariners' Kevin Jarvis...club's 14-6 win that day capped 3-game sweep of Seattle...first and only career homerwas last of 3 consecutive home runs for Texas in the 6th inning on April 25...Gonzalez's blast followed long balls by Laynce Nix andRod Barajas, as the club's 7-8-9 hitters that day combined for the 4th back-to-back-to-back effort in Rangers history...Gonzalezbecame the first Texas player to have his first career homer be part of such an effort and just the 8th such player in major league history...optioned back to Oklahoma on April 29 with a .276 major league average...rejoined Texas on Sept. 13 after Oklahoma waseliminated from Pacific CoastLeague playoffs...went 2-13 overfinal 8 games with Texas...hadcareer-high 3 RBI twice, April 25 vs.Seattle and Sept. 30 vs.Anaheim...batted .316 (6-19) in 5day games...went 5-10 with runnersin scoring position...hit .353 athome...made one error in 101 totalchances at first base for a .990 fieldingpercentage. Oklahoma: Hit .304 with 12 homers and 88 RBI in 123 games for the RedHawks...ranked among team leaders in hits (2nd, 139),RBI (2nd), total bases (2nd, 209), games (2nd), doubles (T3rd, 28) and home runs (4th)...ranked among organizational leaders inRBI (5th) and average (6th)...batted .315 (135-428) with 12 HR and 84 RBI in 115 games after returning from his first stint with Texason April 30...had season-high 10-game hit streak from June 19-28 at .452 (19-42) with 5 doubles, 3 homers and 16 RBI, raising averagefrom .279 to .310...had 2-homer games on June 8 vs. Albuquerque and June 22 at Albuquerque...matched season highs with 7RBI in both of those contests and hit a grand slam off Mike Neu in the June 8 game...recorded season-high 5 hits with 5 runs in theJune 22 game...hit better against lefties (.319) than right-handers (.298)...batted .360 (36-100) with 6 homers and 31 RBI over 27games in June...went 7-13 (.538) with one grand slam and 20 RBI with the bases loaded...hit .308 (65-211) at home and .301 (74-246) on the road...led PCL first basemen with 141 double plays...went 3-16 (.188) with a double and solo home run in 5 playoff gamesfor the RedHawks. Split the season between Albuquerque (AAA) and Carolina (AA) in the Florida organization and Frisco (AA) with Texas after being obtained via trade on July 11...combined to hit .269 with five home runs and 51 RBI in a total of 120 games...began season at Albuquerque and played in 39 games and hit .216 (30-139) with five doubles, one home run and 18 RBI...started the season going 11-23 (.478) in the first five games including a season-high four hits on April 18 vs. Colorado Springs...in the next 21 games went only 10-70 (.143) to drop average to .226...went on a five-game hitting streak after that to raise average to .246 before going 2-22 in his last seven games with the Isotopes...finished April hitting .300 but was at .152 (12-79) in May...batted .272 at home but only .138 (8-58) in 18 road games...sent to Carolina on May 28 and played in his first game on May 30...appeared in 36 games for the Mudcats and hit .307 with 9 doubles, one home run and 16 RBI...registered a hit in 25 games...had 14 multi-hit games...posted a Carolina-high 8-game hitting streak from June 22-June 30 batting .500 (16-32) in which he raised his average from .234 to a season best .312...hit .317 (32-101) in June...batted .315 (34-108) vs. right-handers and .276 (8-29) vs. left-handers...following trade to Texas organization, he batted .283 with six doubles, three home runs and 17 RBI with Frisco...started 13-27 (.481) in his first seven games...registered a season-high 13-game hitting streak from Aug. 4-17 in which he hit .365 (19-52) raising his average from .260 to .304...hit safely in 32 of 45 games...hit .357 (35-98) at home and .187 (14-75) in 19 road games...played in all eight of the RoughRiders Texas League playoff games and hit .233 with no home runs and a team-high six RBI...led team in postseason with seven hits and tied for third with 30 at-bats...played the Peoria Saguaros in the Arizona Fall League and hit .260 with three home runs and 16 RBI in 23 games. Spent the entire season at Portland (AA) in the Eastern League...appeared in 138 games and hit .266 with 34 doubles, career-high tying 17 home runs and 96 RBI...second in the league in games and RBI...finished first on the team in games, at-bats (508), hits (135), doubles, home runs, RBI and slugging percentage (.437)...within the Florida organization he finished first in games and RBI, third in at-bats, fourth in hits, doubles and home runs and fifth in total bases (222)...named by Baseball America as the fourth best Marlins prospect, sixth best first base prospect in the minor league, the seventh best Eastern League prospect and the 31st best overall minor league prospect. The Florida Marlins Organizational Player of the Year and Midwest League MVP at Kane County (A)...helped lead Kane County club to the league title as he hit a career-high .312 with a career-high 37 doubles, career-high tying 17 home runs and a career best 103 RBI...first in the league in hits (career-high 161) and total bases (251) and was second in RBI, third in doubles and fourth in at-bats (516)...named to Baseball America's Low Class-A All-Star team...named by Baseball America as having the Best Tools in the Midwest League the Best Batting prospect and the Best Defensive first baseman...selected by the same publication as the top Midwest League prospect and the third best first base prospect in the minor leagues... selected to All-Star Futures game...selected by SportsTicker to their All-Prospect team, All-Teen team and was their Teenager of the Year among Midwest League players...selected to the midseason All-Star team...Topps Minor League Player of the Month in June...twice named league Player of the Week. Split the season between the GCL Marlins and Utica (A)...appeared in 53 games for the Marlins and hit .295 with 10 doubles, no home runs and 30 RBI...played in eight games with Utica and hit .310 with three RBI...named by Baseball America as the fifth best prospect in the GCL and by the same publication as a first team All-American first baseman. Yasiel Puig's having an amazing postseason, but will his prediction come true? Who's the greatest player to play for both the Red Sox and Dodgers? June 11, 2018 New York Mets released 1B Adrian Gonzalez. January 18, 2018 New York Mets signed free agent 1B Adrian Gonzalez. December 18, 2017 Atlanta Braves released 1B Adrian Gonzalez. December 16, 2017 Atlanta Braves designated 1B Adrian Gonzalez for assignment. November 2, 2017 Los Angeles Dodgers activated 1B Adrian Gonzalez. October 6, 2017 Los Angeles Dodgers reassigned 1B Adrian Gonzalez to the minor leagues. August 18, 2017 Los Angeles Dodgers activated 1B Adrian Gonzalez from the 60-day disabled list. August 12, 2017 Los Angeles Dodgers sent 1B Adrian Gonzalez on a rehab assignment to Rancho Cucamonga Quakes. August 3, 2017 Los Angeles Dodgers sent 1B Adrian Gonzalez on a rehab assignment to Oklahoma City Dodgers. July 29, 2017 Los Angeles Dodgers transferred 1B Adrian Gonzalez from the 10-day disabled list to the 60-day disabled list. Lower back discomfort. June 13, 2017 Los Angeles Dodgers placed 1B Adrian Gonzalez on the 10-day disabled list retroactive to June 12, 2017. Lower back discomfort. May 18, 2017 Los Angeles Dodgers activated 1B Adrian Gonzalez from the 10-day disabled list. 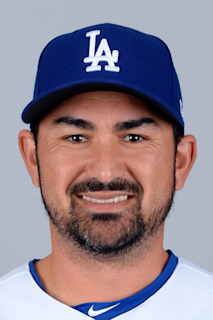 May 16, 2017 Los Angeles Dodgers sent 1B Adrian Gonzalez on a rehab assignment to Rancho Cucamonga Quakes. May 5, 2017 Los Angeles Dodgers placed 1B Adrian Gonzalez on the 10-day disabled list. Right elbow soreness. August 25, 2012 Boston Red Sox traded 1B Adrian Gonzalez, LF Carl Crawford, RHP Josh Beckett and SS Nick Punto to Los Angeles Dodgers for 1B James Loney, 2B Ivan De Jesus Jr. and RHP Allen Webster. December 6, 2010 Portland Sea Dogs Traded 1B Anthony Rizzo and RHP Casey Kelly to San Antonio Missions; San Diego Padres Traded 1B Adrian Gonzalez to Boston Red Sox and Greenville Drive Traded CF Reymond Fuentes to Fort Wayne TinCaps.